The Passage meets The Hunger Games in The 5th Wave - a gripping new series from Carnegie-shortlisted Rick Yancey. Took out half a million people. Put that number to shame. Lasted a little longer. Twelve weeks . . . Four billion dead. You can't trust that people are still people. On a lonely stretch of highway, Cassie runs. Runs from the beings that only look human, who have scattered Earth's last survivors. To stay alone is to stay alive, until she meets Evan Walker. Beguiling and mysterious, Evan may be her only hope. Now Cassie must choose: between trust and despair, between defiance and surrender, between life and death. To give up or to get up. Visit Rick Yancey's website or The 5th Wave website for more information. The arrival of an alien spaceship had mixed reactions from the human population, some were scared while others were hopeful but after 10 days with no form of contact the excitement was starting to turn into fear. Then the first wave hit, wiping out the electricity and causing accidents that killed half a million people worldwide within a few seconds. Confusion and panic spread and continued to grow as humanity was faced with one disaster after another. The 2nd wave was a massive tsunami that wiped out 3 billion people, the 3rd wave was a virus that killed another 4 billion and the 4th wave turned humans against one another so the few remaining survivors started killing each other. Nobody knows what the 5th wave will be but they know that it's coming. It's time for humanity to make their last stand but how do you fight an enemy you have never even seen? There has been a lot of hype surrounding The 5th Wave which I have to admit made me a little nervous to pick it up, I had such high expectations that I wasn't sure Rick Yancey would be able to fulfil them. Thankfully on this occasion the hype is well deserved and I was hooked on the story from practically the moment I picked it up. The story is very character driven and it is a fascinating look into how far humans can be prepared to go in order to survive. It is about trying to keep hold of your humanity in the worst of situations and it will make you think about what you would be prepared to do to keep yourself and your family safe. It will also make you look at movies like Independence Day and realise just how unrealistic the ending was - what chance would we really have against an alien race who have the technology needed to reach our planet? The story is chilling, creepy, dark and twisted but at the same time it shows just how much our will to survive gives us the hope needed to keep fighting for what we believe in. 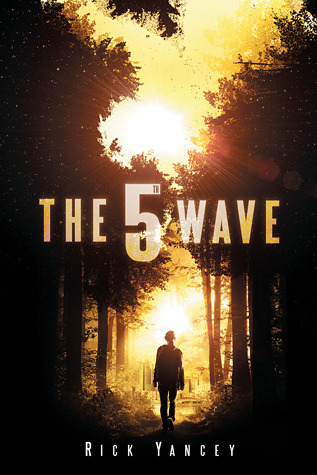 The 5th Wave is told from several different points of view and is set after the 4th wave but with flashbacks showing exactly what happened from the moment the spaceship first arrived. The main character is Cassie, a teenage girl who has witnessed the deaths of both of her parents and whose only remaining relative is the much younger brother who was taken from her. Cassie promised Sammy that she would find him and she is determined to do whatever it takes to try and fulfil that promise. She hasn't seen any other humans for weeks and is beginning to think that she may be the last survivor but she won't stop searching for Sammy until she knows for sure that he is gone. While we are following Cassie's journey we also meet Zombie, a teenage boy who was rescued by the army and taken to a military camp where they are training survivors and preparing to make humanity's last stand against the aliens. The different threads of the story eventually come together but not in the way you're expecting them to. In case you hadn't guessed I loved this story, I really liked the characters and I'm fascinated to see how things play out with the aliens as the series continues. I wasn't a huge fan of the romance and I really hope that we aren't seeing the beginning of a love triangle starting to form but I loved Cassie's relationship with her brother and the friendships that started to develop between Zombie and the rest of his unit. The story was full of twists and turns, some I'll admit I saw coming but a few that shocked me, and the character development was great. This is a series I'm very much looking forward to continuing so I hope we don't have to wait a whole year for the next instalment! Source: This was a gift from Sammee at I Want To Read That, thanks Sammee!! The 5th Wave is Coming . . .